Poverty is not vanishing from the planet, though substantial progress has been made in eliminating extreme forms of it. We investigate the latest facts. 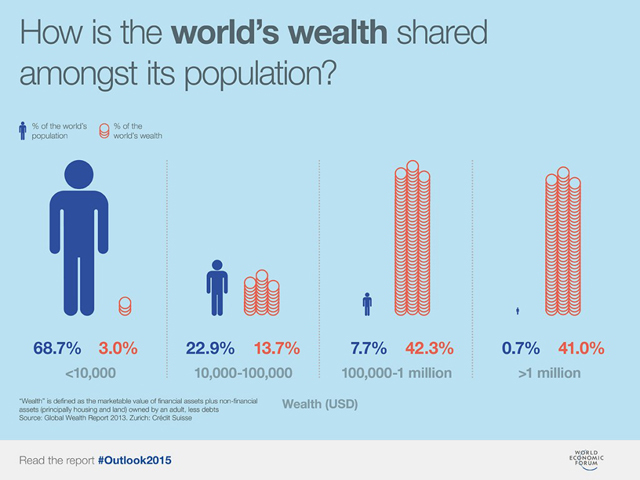 Hugely unequal, hugely iniquitious : Global inequality today is at a level which was last seen in the 19th century. The concern is that it is continuously on the rise if we use concentration of wealth as the indicator. The world’s eight richest people own as much wealth as the poorest 3.6 billion. But Walmart discounts heavily? US Senator Walton Bernie pointed out that Walmart now owns more wealth than the bottom 42% of the US population. It is also found that the wealth of the world’s three richest people is more than that of all the 122 million people in three countries – Angola, Burkina Faso and the Democratic Republic of Congo. These facts present a picture that’s frightening and loaded against the grain of extreme capitalism. Extreme poverty reduced : Great progress has been made on reducing extreme poverty – consumption of less than $ 1.90 per day – in the recent decades. In 1981, 42% of the world’s population lived in extreme poverty, which by 2013, has dropped to below 11%. Extreme poverty is not only a problem of the poor countries but it is a serious problem in rich countries too. The World Bank and UN have played a great role in carrying out anti-poverty programmes. Americans at the bottom : Several million Americans now live in households with per capita income of less than $ 2 per day. Given the much higher cost of living, such an income can pose a much greater challenge in countries like the US. Deep Dive : Read tonnes of material on poverty and government schemes - here! The rich pay less! Surprisingly, the rich pay less per unit for many goods and services, like flying. A study of Indian villages shows that the poor face systematic price discrimination. Another example is the taxes. The wealthiest people are often able to take advantage of loopholes and deductions which are not available to those earning less. Rich elections, Poor elections! There are other imbalances as well, which are equally damaging. In any situation where one’s rights are not enforced or specified, the outcome will depend on customs, which would almost always be in favour of the rich. The rich can even influence elections through donations. This undermines democracy. My nation greatest – the rise of nationalism! As people struggle to hold on to their shrinking share, their anxiety has created a political opening for opportunistic populism (nationalism, protectionism), which is shaking the world. In the globalised world, inequality cannot be left to market forces and local communities. The need to devise new rules, redistribution systems and global agreements is becoming a matter of survival.